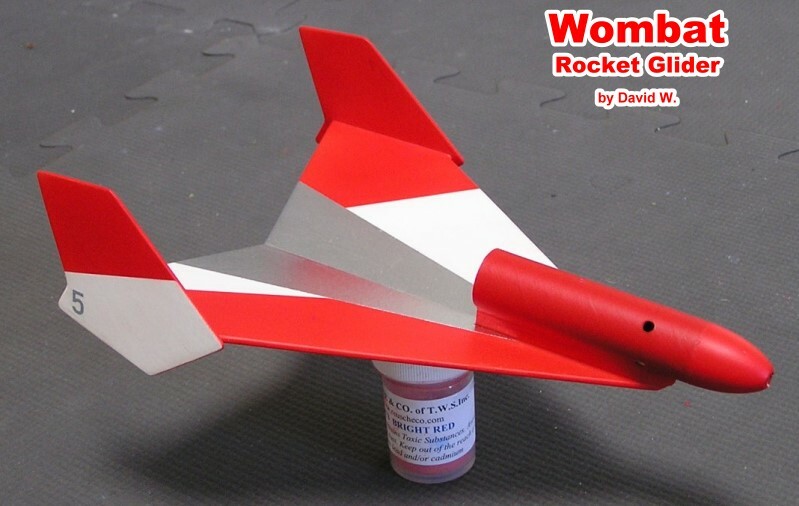 While doing research on rocket-powered gliders and boost-glide rockets, I ran across the Wombat rocket-boost glider design and tried to find either a source for buying a kit or for buying the plans. Neither seem to be available - at least not for me. When I posted a photo of David Wagner's Wombat, I requested knowledge of a source for plans and someone send me an old scanned set. I cleaned them up and posted them here. If you are the copyright owner and do not wish to have them posted, please let me know and I will remove them posthaste. Your Wombat glider has been designed with simplicity, durability and strength in mind. If you follow the Instructions closely, your glider will afford many beautiful flights. Read the following Instructions completely before you start construction. For best results, trace the fin and wing patterns accurately since the glider flies best with these particular patterns. Step 2. Cut the fin patterns from the pattern sheet. Lay them on the balsa as shown on the sheet and trace them onto the balsa sheet, being aware of the direction of the grain. Cut out the wings, stabilizers, pylon sections and glue spreader. Step 3. Sand all parts so they are the same size as shown on the patterns. You may wish to round the corners on the pylon pans for appearance and performance; it is advisable to sand them after gluing them together as you will be assured a better fit. Step 4. Glue the pylon parts together and set aside to dry. 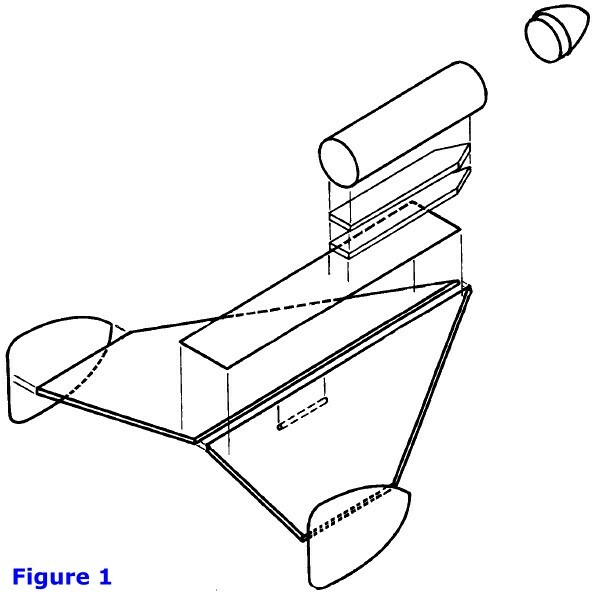 Next, glue the wings together as shown in Figure 2. 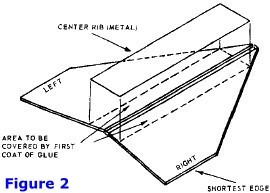 Be sure that the cement rib (metal sheet) is well centered on the joint between wings. For best results, apply a coat of glue to one side of the rib and to the area on the wings where you intend to glue the rib. Let this coat dry at about 10 minutes before applying a second coat to the wood and finally gluing all 3 parts together. Put the wing assembly between two sheets of scrap paper and under several large catalos or books so that it will dry flat and even. Step 5. While the wing is drying, you may sand the corners of the pylon until they are slightly rounded. 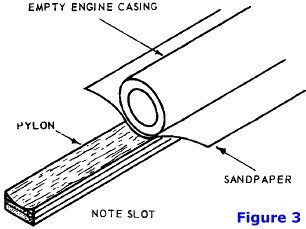 Using an empty engine casing wrapped with sand­paper, sand a shallow slot into one side of the pylon so that the curve of the slot fits around the body rube. 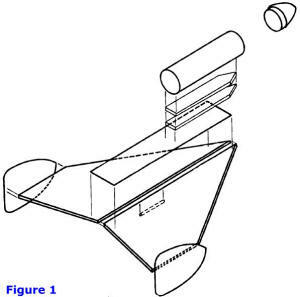 (See figure 3). This slot need not be deep since its only purpose is to increase the gluing area between tube and pylon. Step 6. Apply a coat of glue to the slot and to a portion of the body tube of the same size as the pylon. Let this coat dry about 5 minutes. Apply a second coat to the pylon slot and glue the pylon to the body tube so that the blunt end of the pylon is flush with one end of tube. Set aside to dry. Step 7. When your wing assembly is dry enough to handle (about 30 minute, after gluing) remove the catalog, or book and place it on a flat surface. Next, apply a coat of glue to the shortest edges and let it dry. Meanwhile, apply a similar coat of glue to the center of the vertical stabilizers along the lines shown in the fin patterns. 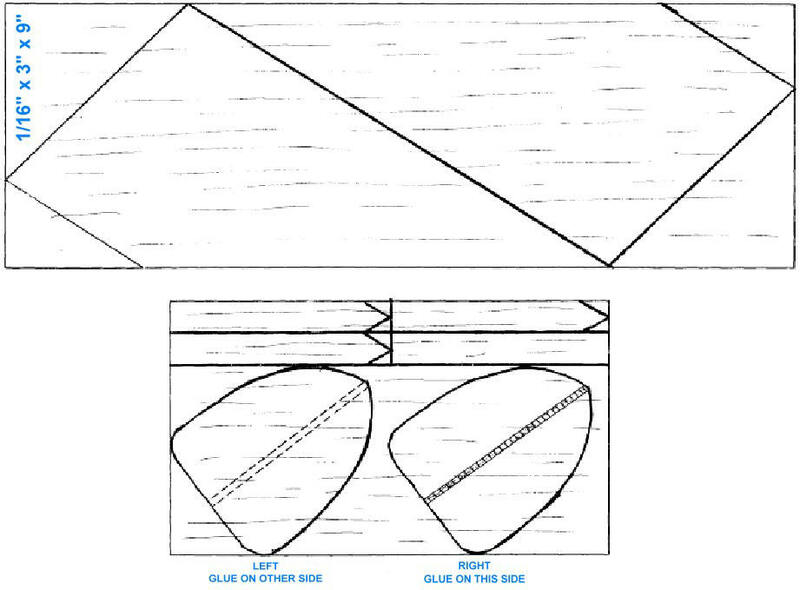 Be sure you apply the glue on the correct side of each stabilizer; you may check by comparing each stabilizer with the one on the pattern sheet with reference to grain and indicating notes. After these coats of glue are dry, apply a second coat to the shortest edges of the wing and glue a single stabilizer to one edge of me wing. Be sure the pointed end of the stabilizer fits flush with the front end of the shortest edge of the wing. Place the wing between the books so that it is held with the attached stabilizer above the books; that is, place the wing perpendicular to the table on which you're working. When that stabilizer is dry, attach the other one in the same way. Allow this assembly to dry at least 10 minutes before proceeding. Step 8. Apply a coat of glue to the flat side of the pylon which should now be glued to me body tube. Let the coat dry for several minutes before applying a second coat. Glue the pylon tube assembly to the wing so that the pointed end of the pylon and wing are glued at the same point. Align the body tube so that it points down the center of the whole glider. This alignment is very important - if the body tube is glued off to one side, or is pointing to one side, the rocket will loop and crash upon takeoff. Step 9. While the tube-wing assembly is drying, glue the launching lug to the wing about 2½" to 3" from the front of the wing. Set aside the glider to dry with the body tube (pod) up. Step 10. When your completed glider is dry, round the edges of the wing and stabilizers to decrease drag and turbulence. Step 11. After the glider is completely dry, take it outdoors or to a large, open space for flight testing. Hand toss by grasping the launching lug and throwing it lightly into the wind. If the glider drifts to one side, sand the bottom of the wing on that side. For example, if your glider drifts to the right, sand the area behind the launch lug on the light side. Keep in mind that the right side when the pod is up is the left side when you flip the glider over for sanding. 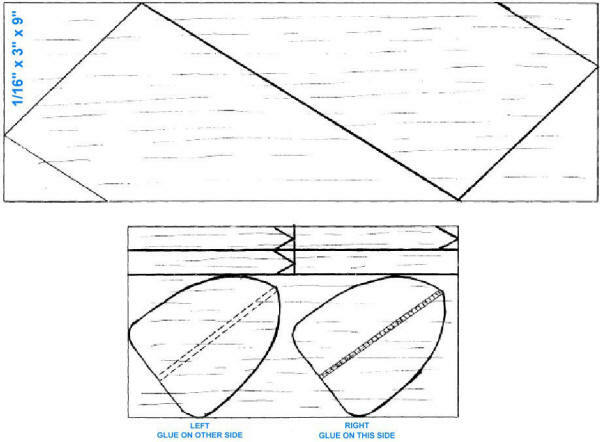 If your glider refuses to glide at all, sand the area behind the launch lug so that the trailing edge of the wing tapers. If your glider stalls (nose turns up and rocket falls), add a small amount of weight to the nose cone. Adding or subtracting weight in a light glider like the Wombat is critical so use pieces of cardboard glued together to add just the right amount. Step 12 When your glider is properly trimmed, you may wish to paint it. To obtain a smooth finish, apply one or two coats of sanding sealer, let dry and sand with very fine sandpaper between coats. Spray with red-orange or fluorescent red-orange paint for best visibility. Step 13. After you have completed painting, test-glide your Wombat once more and add or subtract weight as is necessary. When you are satisfied with the glide, glue your nose cone in place. You may wish to alter your Wombat for use in accordance with NAR rules. To do so, simply cut off the rear 1" of the body tube. Whenever you fly your glider, tape a 1" wide streamer to the rear of the engine and wrap it around several times. Tuck the loose end of the streamer between the pylon and the engine so that it won't flutter or come loose on takeoff. Be sure to test glide your Wombat after removing the 1" of body tube since you may have to adjust for the loss of weight of the body cube. The Wombat should be launched from a 36" launching rod, Electrical ignition must be used at all times and it is safest to fly the Wombat when winds are under 20 miles per hour. If you are using a small area, use only ½A's and A's. A and B engines will give more spectacular flights but you stand a greater chance of losing your glider. Good luck and good flying!